Welcome to charter this new 40′ luxurious catamaran sail yacht out of San Diego. 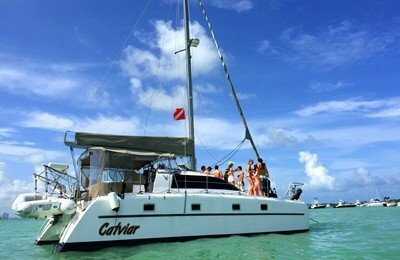 Enjoy a brand new, large sized catamaran from France, and experience luxury yachting in style. The new 40 foot catamaran yacht invites you to cruise in harmony with the beauty of your surroundings. Designed for maximum living space and boasting beautiful natural light throughout its interior, this elegant and luxuriously appointed catamaran also delivers performance at sea. Immerse yourself in the panoramic 360° views made possible by the expansive salon windows and integrated mast foot, marvel at the responsive handling in the spacious helm station, or surrender your cares as you relax in the supremely designed cockpit or indulgent lounge deck. Experience San Diego’s amazing harbor. 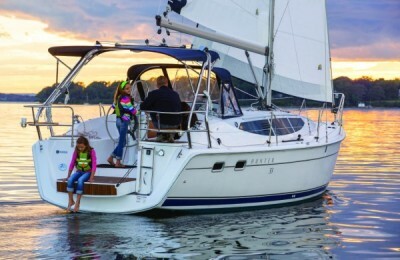 This affordable private yacht charter offers a 3-hour trip for you and your group of up to twelve total for an enjoyable time along the Southern California’s coast. Sail the smooth waters inside this huge, stunning harbor, with San Diego’s gleaming skyline as a back drop. The marina is close to down town with its many attractions including the charming “Little Italy” neighborhood. Seeing this world class harbor from the sea, with its naval installations, and nearby natural ares like “Sunset Cliffs” park is quite a unique experience. Every single minute during this tour will be a cherished memory. 3 hours from leaving the dock. Extra hours are available to add while book the yacht at $180 per hour.